Soapbox gives us the look of luxury for less with this elegant croc embossed Jesse bag. This style of handbag is ordinarily casually toted by college students, but with the stylish croc embossing it becomes a much more adult affair. Considering its bargain price of less than $60, this synthetic does a decent crocodile impersonation. The scaly surface is continued over the handle and the adjustable shoulder strap. This long strap is removable too, so you can convert the Jesse to a briefcase for a more polished business look. The interior is made for office use too. There's enough space for a laptop, although the interior isn't padded so you don't want to knock it about. There are interior pockets too, perfect for stashing away your pens, Blackberry, and other small workplace essentials. I've seen so many high class business bags lately with four figure sums attached, so it's refreshing to see Soapbox create one for the interns and junior employees. Just opt for the croc finish, rather than the black fur, if you really want to be taken seriously. 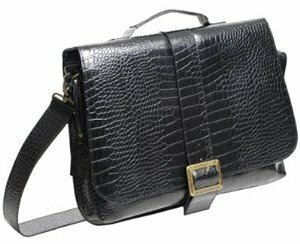 The Soapbox Sara satchel bag, a great alternative to this croc-embossed bag.